Shimlas centre Kurt Eybers on attack. 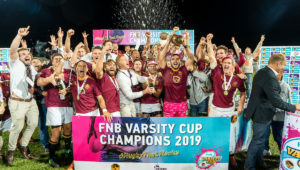 Shimlas began their Varsity Cup campaign with a 47-25 victory over UWC, while there were also wins for Wits and Maties on Monday. On a blustery day in Cape Town, Shimlas, who had a bye in round one, got their season off to a great start as a strong second-half performance saw them claim a bonus-point victory against the optimistic competition newcomers. In an end-to-end match, the visitors raced ahead thanks to a converted seven-point try from fullback Sechaba Matsoele, only for UWC to claw their way back into the contest with a try from scrumhalf Clayton Daniels and penalties from centre Lyle Hendricks, putting them 11-9 ahead. After left wing Marnus Boshoff scored for Shimlas, the home crowd were up on their feet again as flyhalf Aidynn Cupido read an attacking play perfectly to intercept and race away for a try. It seemed like the lead would remain with the hosts, as the first half drew to a close. However, Sibabalo Qoma crashed over from close proximity and Taylor converted to hand Shimlas a 21-20 advantage. The hosts were pinned back on several occasions in the second half, resulting in Shimlas gaining the upper hand on the scoreboard. 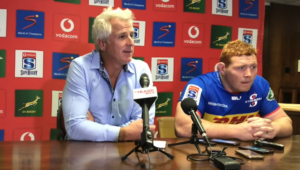 Three unanswered tries, from Janco Cloete, Boshoff and captain Henk Pretorius, along with a single conversion, meant the visitors took a 20-point lead heading into the last quarter of the game. UWC were not helped by their lack of discipline, with two players seeing yellow cards minutes apart from each other. Tristan Leyds did help pull things back for the home side by setting up a try for wing Andre Manuel, but that was cancelled out when Qoma grabbed his second to round off the scoring. 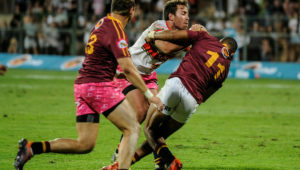 Later in the day, Wits were given a scare by CUT as they had to work hard to come away with a 25-15 win in Johannesburg. A brace from wing Kwanele Ngema to go along with a penalty try and Daniel Kasende’s effort saw last year’s semi-finalists home. CUT stayed in the contest thanks to the deadeye boot of Heinrich Bitzi, who slotted five penalties. 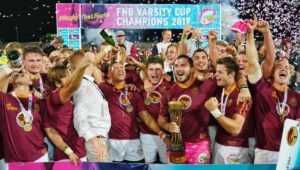 Maties claimed the Cape bragging rights as they punished a poor defensive performance from UCT to come away 66-5 winners. The match between UJ and Tuks, which was meant to kick off at 6:30pm in Johannesburg, was delayed until 8pm before being postponed due to loadshedding, The game will now take place on Tuesday at 2pm. 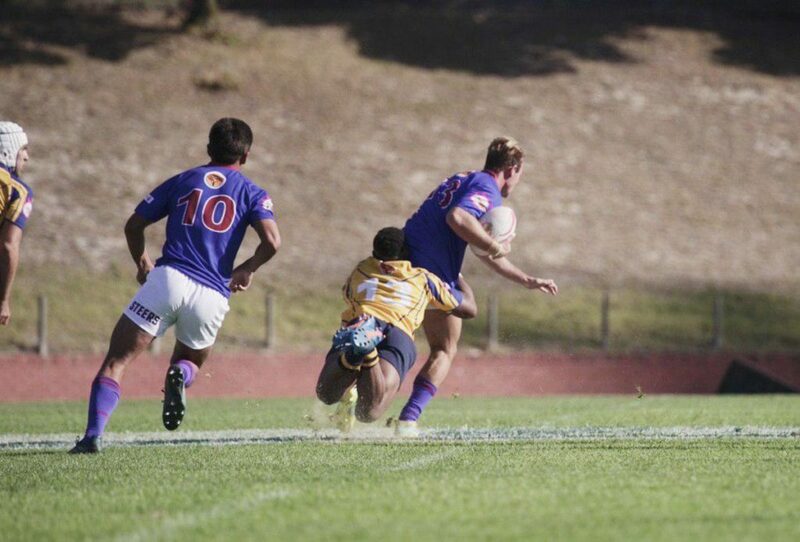 UWC (25) – Tries: Clayton Daniels, Aidynn Cupido, Andre Manuel. Conversions: Lyle Hendricks. Penalties, Hendricks (2). Shimlas (47) – Tries: Sechaba Matsoele (7 point try), Marnus Boshoff (2), Sibabalo Qoma (2), Janco Cloete, Henk Pretorius (7-point try). Conversions: Justin Taylor (4). Wits (25) – Tries: Kwanele Ngema (2), Daniel Kasende. Penalty: Chris Humphries. CUT (15) – Penalties: Heinrich Bitzi (5). UCT (5) – Try: Nyasha Tarusenga. 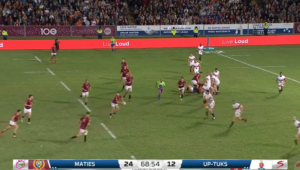 Maties (66) – Tries: Duncan Saal, Cornel Smit (3), Stephan Streicher, Edwill van der Merwe, Johan Momsen, Reinhardt Fortuin, Sesink-Clee Jordan, Johann van Niekerk. Conversion: Jordan Chait (2), Fortuin (5).